A lower middle-income country, Papua New Guinea is home to one of the world’s most ethnically diverse populations. Most people live in rural areas, often in areas of difficult access. This represents a complex challenge for health care and social services delivery. Fertility rates are high. 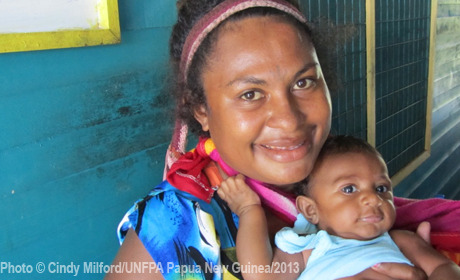 UNFPA started work in Papua New Guinea in 1996. It helps improve the quality of and access to maternal, newborn, child and adolescent health services, including for sexual and reproductive health. Programmes support in achieving the national development plans, extending measures to prevent and respond to gender-based violence, and collecting and analysing population data for development planning.